North 24-Parganas district in West Bengal is dotted with brick kilns. These have always provided seasonal employment to landless labour from the arid regions of Purulia, Bankura, Jharkhand and Bihar. But there are no amenities for the thousands of migrant families who throng to the kilns and child labour is rampant. Finally, there is a ray of hope. Thanks to Prayasam’s Progoti and Parivartan programmes in Icchapore and Manirampur in Barrackpore and Haroa, under the aegis of the local administration, many of these children can now dream of a better life. Previously, on a visit to any of these kilns one could see hundreds of children lending a helping hand to their parents as they carried soil from the river banks, prepared the clay mixture with various chemicals for bricks and then moulded the bricks by hand. The going rate of Rs. 100 for 1,000 bricks was no small temptation for their families. In December 2005, realising that it would be difficult to wean children away from this kind of income for migrant families, the district administration invited Prayasam, an NGO working with underprivileged children, to chalk out a project. Prayasam decided to provide educational facilities to the children by reaching out to brick kiln-owners. 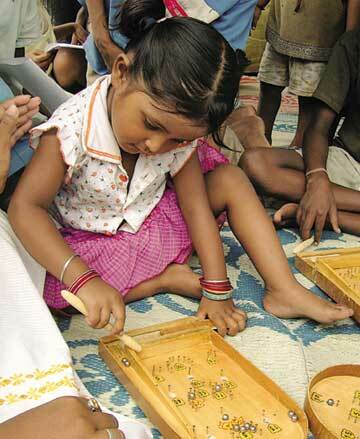 Parivartan, the Haroa project, was started with the support of Unicef in December 2005. The project in north Barrackpore was started under the aegis of the north Barrackpore municipality with the support of the DFID-backed Kolkata Urban Services for the Poor (KUSP). Today, Prayasam’s 20 non-formal schools that double up as multiple activity centers (MACs) reach out to 1,250 children in Haroa, and more than 900 children in north Barrackpore. As Prayasam founder-director Amlan Kusum Ganguly points out, the two projects cater to 26 brick kilns in Haroa and 10 in north Barrackpore. How did they get brick kiln owners to agree? Some brick kiln owners found it difficult to retain labour since migrant families were getting a choice of jobs. They felt Prayasam’s project would help labour to stay on. Progressive kiln owners like Sandhya Singh of BVS kiln were the first to respond to the NGO’s request for cooperation fort the betterment of their workers. The restrooms of the overseers in such brick kilns were converted into classrooms. For the children, it was a novel experience and they grabbed it with both hands. Take nine-year-old Pavan, whose family is from Wazirganj in Bihar. Constant migration denied him the opportunity to go to school until last year. A few months at the school in the Shankar brick kiln at Manirampur in North Barrackpore opened new vistas for him. “I love learning numbers, reciting poems and singing songs. I have also learnt to make monkey masks now,” says an excited Pavan. For fatherless Nandini Kahar and her siblings whose mother works at the BVS brick kiln in Icchapore, school was a distant dream. But the opportunity to read and write proved a boon for her. For 10-year old Pinky Mahato, one of three sisters and a brother belonging to a family that has migrated from Gaya in Bihar for the brick-making seasons, attending the non-formal school since the last three months has meant learning dance, songs and a few angrezi words. These children work at the kiln from 6 am to 10 am in the morning. After a bath and a quick brunch, they are at the school till 3 pm after which they return to the kiln and work until dusk. The teaching pattern in both schools is similar. Children come in as they like. The younger ones, who do not assist their parents, are in by 11 am, while the older ones come in later. Learning is never by rote, as teachers Shibani Mukherjee and Shankari Das clarify. The children play football and learn to skip, make masks or draw. Songs, skits and dances are often learnt and staged. To encourage the children to express themselves, Prayasam has also been making use of comics. This has caught the imagination of children, especially girls. Through the medium, they open up on girl-child education and the importance of letting the girl-child blossom into an individual in her own right. Besides, the children’s theatre group, Dakabuko (Dare Devils), and dance troupe Ahladi (Loved ones) teach them to stage plays and dance dramas on health and social issues from time to time. This has helped children learn the significance of hygiene and sanitation and pass this on to their parents and elders. Once a year, a camp is organised at one of the multi-activity centers. “We let the children do whatever they like, depending on what they have learnt until then,” explains Ganguly. 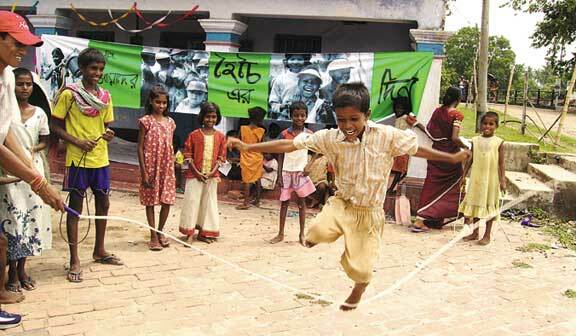 They make kites, dolls and collages from waste material, play and in short, have a ball. Now even the parents come forward expressing a desire to learn along with their children. As Ganguly and Sarkar say, “They would come and tell us – aap hamme bhi kucchi sikhalaiye, hum bhi to angutha chaap hain.” The parents don’t confine learning to writing their names. They are as excited as their children to learn kite-making and kantha stitching. A lot of mothers love making dolls too. They have also imbibed the basics of hygiene, population control and nutrition. A good beginning has been made. But the future of these centers is still uncertain. The district administration is expected to take over the MACs, once the initial donor funding is over. Assurances by the authorities concerned are yet to take effect. Neither have any of the kiln owners taken over the MACs. Also, many kiln owners are yet to come forward and facilitate adoption of the scheme. This article first appeared in Civil Society, Vol 5, No.11 September-October 2008. It is reprinted here with permission.